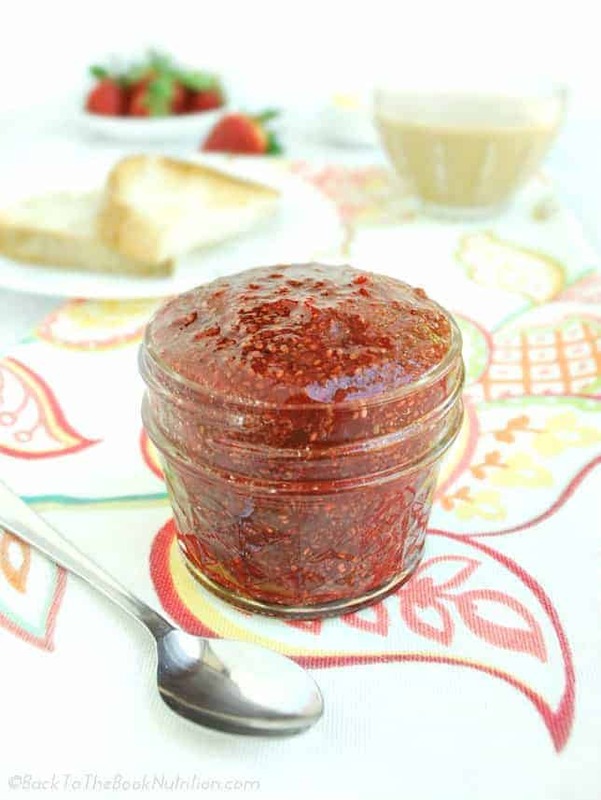 Today we’re celebrating with a super simple chia jam that highlights the natural sweetness of all those juicy strawberries filling the farmer’s markets and produce aisles right now. 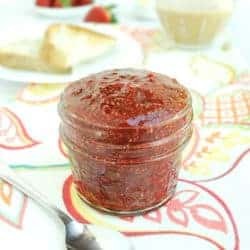 I used to assume that making homemade jam and jelly was complicated process that required special equipment and lots of time…until a couple of years ago when I discovered chia jam. 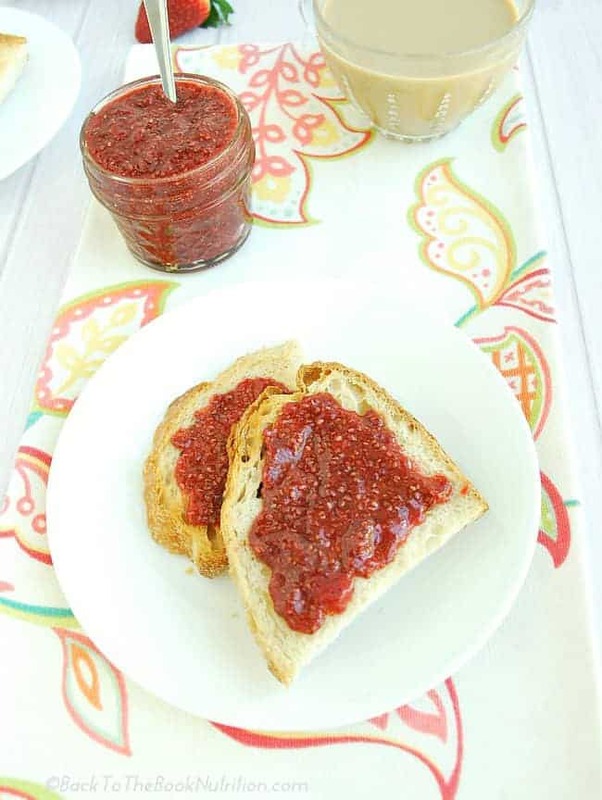 Chia jam is an excellent alternative to traditional jellies made with pectin because the soluble fibers in chia seeds create a natural gel to thicken the jam or jelly – and all you have to do is stir them in and let them sit. So easy! Want to know more about the nutritional benefits of chia seeds, and get tips for how to store and use them? Read this chia vs. flax post. You only need 4 all natural ingredients: strawberries, raw honey, lemon juice, and chia seeds. And just 20 minutes and 3 easy steps later, you’ve got homemade jam! Chia jam has become a breakfast staple at our house – Strawberry, Blueberry, and Berry Cherry Chia Jam are all favorites! They make great Mother’s Day gifts too! Plus, they’re easy enough for kids to help…and what mom or grandma doesn’t love a gift the kids had a part in making? 1. Bring berries and honey just to a boil in saucepan over medium heat. 2. Reduce to a simmer and continue to heat for about 15 minutes. 3. Add lemon juice and continue heating for a few more minutes. 4. Remove from heat and use an immersion blender or potato masher to puree/mash berries to desired size. 5. Stir in chia seeds and allow mixture to cool before transferring to glass jars. Store in refrigerator. Once chilled, the mixture will thicken to a jam like consistency. Will last a few months in the fridge. Can you can this jam? Also, what about using Stevia? I don’t see why you couldn’t can it, though I’ve not tried it myself. You might consider allowing it to sit in the fridge overnight first though to be sure the chia seeds have time to create their natural gel. As for the Stevia, I don’t use it routinely, but I would think you would use far fewer chia seeds since you wouldn’t have the added liquid from the honey. I did find another chia jam recipe online that used Stevia. Using their ratio of seeds to berries, you might try using just 3 Tbsp chia seeds if you’re replacing the honey with Stevia. I also wonder if cutting the lemon juice back a little might be a good idea as well?